(Bloomberg) -- If Alan Dershowitz gets fed up with Martha’s Vineyard, he might try the Hamptons. Then Hollander, a landscape architect who’s worked for Goldman Sachs Chief Executive Officer Lloyd Blankfein, former Trump administration economic adviser Gary Cohn and hedge fund manager Steve Cohen, ticked off some other differences: The Hamptons has Wall Street, media, legal and fashion titans. Its culture emanates from New York, not Boston and Washington. And it’s hyper social. Hollander gestured to the 400 or so guests that he was about to join at Bay Street Theater’s annual gala. It was Dershowitz’s line about friends “shunning me and trying to ban me from their social life on Martha’s Vineyard” that got the chattering classes chattering. The lawyer and professor emeritus at Harvard Law School included it in an op-ed piece he wrote detailing the divisions between President Donald Trump’s supporters and opponents, and in particular the culture of judgment. Dershowitz’s friends had taken aim at him -- a lifelong Democrat -- for defending Trump. This week he publishes “The Case Against Impeaching Trump," in which he argues that the U.S. Constitution doesn’t support pushing him out of office. The chattering involved a lot of talk of the culture of Martha’s Vineyard, whose summer denizens lean heavily toward media types, entertainment figures and academics with a liberal bent. Former presidents Barack Obama and Bill Clinton regularly vacationed there while in office. “On my part of the Vineyard, you can’t find a Republican,” Dershowitz said in a telephone interview Monday. The Hamptons meanwhile is a famous pocketbook for Democratic and Republican presidential candidates. These parties have their enclaves on the South Fork that usually stick together though sometimes mix. “We can disagree politically, but it’s not a life-encompassing all exclusive kind of thing," Hollander said. 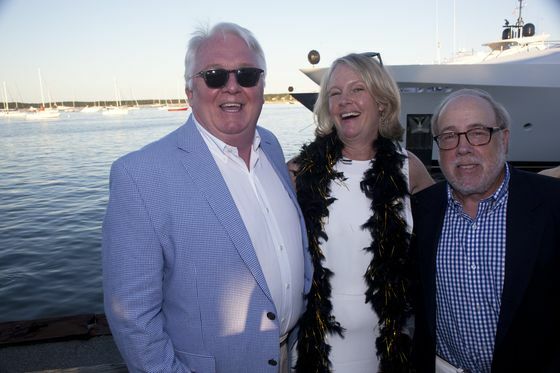 Aidan Corish, a Sag Harbor village trustee, worked to bolster Hollander’s case that Dershowitz would find a more tolerant, welcoming culture in the Hamptons. “We’re not going to isolate anyone,” Corish said of Sag Harbor in particular. "I’ve heard diversity of opinions expressed, but no one gets disinvited." A gong rang, a sign to start moving to dinner and the musical entertainment. Comedian and actress Jane Lynch (“Glee,” “The Marvelous Mrs. Maisel”) was already at her table with actor Richard Kind. Hollander was ready to drop the subject of politics and pick up another. 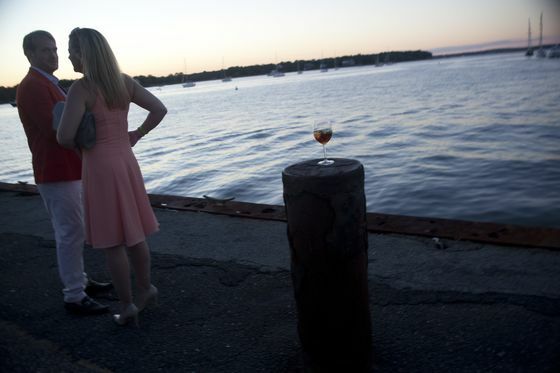 “The people that are on the Vineyard are Red Sox fans," he said. "Yankee fans come from New York and they’re accepting, kind and generous. We’re a little bit behind the Red Sox, but even if they have a better baseball team, our karma and overall life essence is so much better. You can see what it does being a Red Sox fan. What’s happening in the Vineyard, it’s a disaster."